Online cab provider Ola to start online food delivery service. Bengaluru: Only two months after Ola, an online cab provider, started a food delivery service called Ola Café, has now started another pilot project to deliver groceries through its new Ola Store. 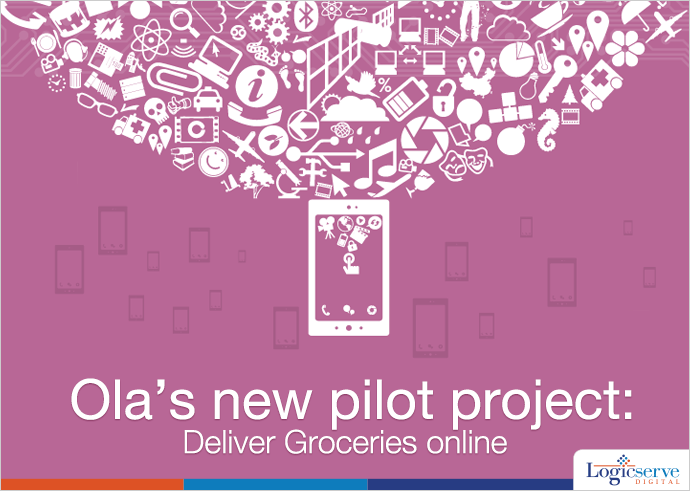 The customers of Ola Café were asked to experience their new grocery store online through an email. The email also mentioned about the 50% discount on the first order the customer would get. Orders placed above Rs. 300 will receive free delivery and below the said amount would attract Rs. 50 delivery charges. It is unclear yet, if Ola will hold inventory in warehouses or tie up with hypermarkets and grocery stores. They have common categories like dairy products, fruits, vegetables, groceries, electrical appliances, medicines and health supplements in this store. Over the past 18 months, Investors have invested more than Rs. 750 Crore into online groceries and delivery companies. According to India Brand Equity Foundation, online groceries market in 2020 is expected to touch $480, thus, grabbing notice of other online retailers like Bigbasket, Localbaniya, Grofers etc. Being on a capital-raising spree to fund its expansion, it has raised more than Rs. 3700 Crore and is planning to get investors raise atleast Rs. 3000 Crore more.